Windwalker Cabin is the first of two of our vacation retreat cabins. Located on a remote wooded property in the Blue Ridge Mountains, halfway between Boone and West Jefferson. North of Boone near the Historic town of Todd and only 3 miles from the awesome New River. Rushing water and beautiful native trout stream along with stocked “catch and release” pond all within walking distance or short drive from cabin, make this a family friendly one of a kind retreat. Peddle Boats and canoe included with stay. 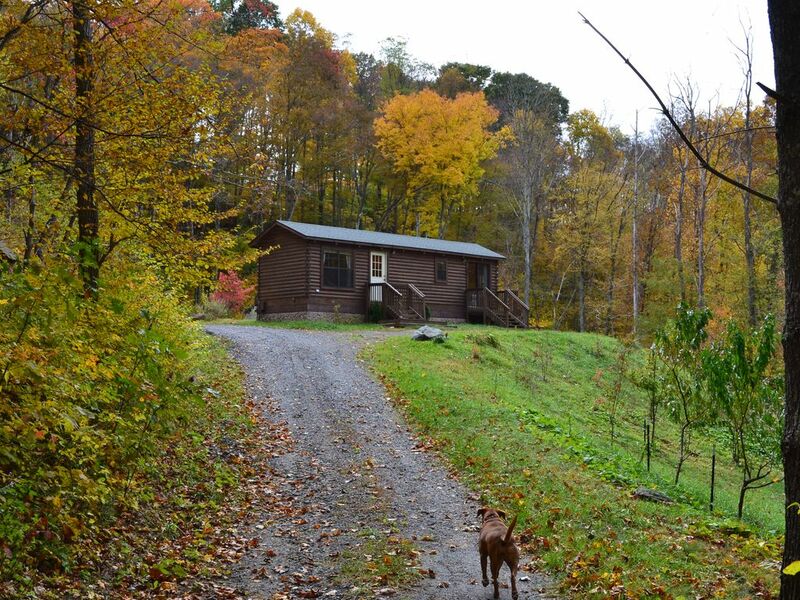 Mountain terrain and 24 acres of beautiful woods. Some hiking trails with many views for the hiker or trail walker. Fish, swim or peddle boat on Windwalker Pond just 1/8 mile from tiny home. Native trout live in stream that runs beside property and Rainbow, Brown and Brook trout are stocked just below the property in the hatchery supported area of the . There are several roadside access locations downstream from property for public fishing. Wildlife is bountiful all around the property. Awesome bird watching too. Beautifully furnished and decorated cabin, with firepit just off porch. Full size refrigerator and stove, with all the utensils you will need. Coffee pot, blender, microwave as well as pots, pans, bowls etc. Stargazing on clear nights is just awesome! Located just over 3 miles from Historic Todd and the New River. Just 25 minutes from shopping, restaurants, movies etc. in Boone or West Jefferson. Only 40 minutes from the famous Blowing Rock. The Blue Ridge Parkway is a short 20 minute drive away. There are guided fishing tours, canoeing and kayaking located in Todd. This 400 square foot true log cabin with all wood interior is the perfect place for a quaint vacation, retreat, anniversary or honeymoon. Near Blue Ridge Parkway and ski resorts. Four wheel drive vehicles, AWD vehicles and/or chains recommended in winter months, November thru March, due to inclement weather conditions. Awesome views in all months. Rate includes all fees and charges except cleaning and pet fee. Cabin is located on country gravel road and has lots of potholes, so speed limit is 10 mph the last 1/2 mile. This is a farm and occasionally a tractor, ATV or other equipment is in use. We try not to disturb our guests. Sorry smoking inside. Pet Fee is $75 per pet. Please add extra pet fee when booking if bringing more than 1 pet. Thanks for checking out our retreat. Moved to the awesome NC mountains from FL in 2003. We enjoy sharing our cabin in the woods. The Boone/Todd area is probably one of the most beautiful areas in the USA. After living in Alabama and South Florida and traveling this great nation, I have come to love not only the scenery, but the friendliest people in the country. 3 acre lake with fishing, swimming and pedal boat on property. Three Top Creek is located on property and is a North Carolina stocked trout stream. TV with DVD player only. Plates, bowls, cups, glasses, forks, spoons, knives, steak knives and most kitchen utensils. Room for 4 at kitchen table. Picnic table outside and 4 adirondack chairs. A few books and local magazines provided. Checkers, chess, backgammon, cards and some puzzles. Some available, but recommend Red Box in Boone or West Jefferson for more variety of movies. 2 pedal boats and canoe available. Some adult life vests provided, but we recommend you bring your own. Fire pit and 4 Adirondack chairs for your stargazing. Very remote location with great star gazing, but close enough for a great restaurant dinner in Boone or West Jefferson. This is my second time staying at the cabin. I absolutely love it. We take the dogs each time for a little get away. Its tucked away nicely for privacy, which we look for, and it has everything you need. Boone is not too far, and neither is the parkway for hiking and sight seeing. Highly recommended! Cabin was cute and comfortable. Would definitely stay again! Thank you Sarah so much for leaving the cabin so clean and tidy. Please come and stay with us again. Cozy cabin tucked in the mountains! We had a great stay ! The cabin was extremely clean when we arrived. The bed is super comfortable and the decorations and amenities were great as well! Very relaxing! As others have mentioned the road getting in has a lot of potholes (We’ve gone off-roading for years so it didn’t bother us one bit) but totally accessible with careful driving. It’s all part of the mountain experience! We will definitely be staying again ! Thank you Rick and Dana for having us! Thanks guys, please come back again soon! The Windwalker Cabin was the perfect place for us to getaway for a Valentine's trip! We loved our stay at the Cabin!! we had a great time at the WindWalker cabin. Thank you Rick and Dana! Will need to come back during Fall. Thanks guys! See you next time! This cozy cottage is the perfect sucluded get away. It sits on the top of the hill so you’re literally all by yourself. Has a nice outdoor fire pit. The cabin is adorablely decorated too! The owners a kind and responsive. Just bring groceries, the cabin has everything else you’ll need. I would definitely love to come back! Thanks guys, you are awesome guests. We hope to see you again soon! Todd, General Store, New River, Zaloos canoes and Rivergirl fishing within 4 miles of cabin, ZIP LINE, Skateboarding, Tweetsie Railroad (closed in winter) and Art Galleries all within 20 miles of property. Pet fee of $75 per pet. Paddle boat use included with booking. Thanks for staying with us.